A copy of an Anglo-Saxon charter indicates that this was Gislheresuuyrth in 677 – ‘the enclosed settlement of a man called Gīslehere’. The ‘G’ wasn’t dropped from the name until the mid-13th century, by which time Isleworth had evolved into a village on a manorial estate. Following the dissol­ution of the monas­teries the increasing private ownership of land led to the devel­opment of Isleworth as a wealthy resid­ential area. Among the titled residents, Lord Grey of Warke was living in a house on the south side of Swan Street in 1635. The village was solidly estab­lished by the mid-17th century but nothing remains from this period. The ‘very ancient’ church of All Saints was rebuilt in 1707. The London Apprentice public house dates from 1731 and is said to have been named after the apprentice liverymen who rowed all the way here from the City of London on their days off. Church Street and Lower Square acquired some fine stuccoed terraced houses in the 18th and early 19th centuries, and several have survived. The arrival of the South Western Railway’s Hounslow loop line in 1849 prompted the richest residents to move farther out of London and encouraged the growth of market gardens in place of orchards. The earliest phase of suburban devel­opment took place in Spring Grove and Woodlands. The railway brought factories too, and Pears soap was made in Isleworth for a hundred years from 1862. 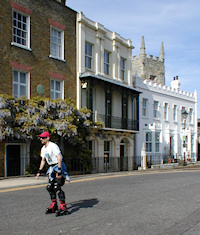 The new resid­ential quarter of St Margarets filled the gap between Isleworth and Twickenham at the end of the 19th century. The Great West Road came to the north of the district in the mid-1920s, bringing semi-detached houses that joined Isleworth to Osterley. The construction of the Mogden waste water works in 1936 reduced the appeal of the south-western corner of Isleworth and locals have been protesting about the odours ever since. All Saints’ church was badly damaged by arson during the Second World War, when enemy bombing devastated the indus­trial wharves. This destruction, combined with council clear­ances before and after the war, left large chunks of Old Isleworth desolate and it was several decades before the area was fully redeveloped. The church was rebuilt in 1970, with a modern extension tacked on. The council and private developers built numerous blocks of flats in the second half of the 20th century and other parts of the old town have since been subject to further modern­isation, especially in the late 1980s, with a complex of riverside terraces, offices and a pub. Recent gated blocks of loft-style apart­ments have further added to the disharmony but Old Isleworth never­theless retains enough heritage to justify its appel­lation. Odeon Parade is a conversion of Isleworth Studios (formerly the Odeon cinema) into 36 apart­ments. Isleworth is the home of the massively redeveloped West Middlesex University Hospital and – on the Osterley border, beyond the top of the map below – of Sky TV. 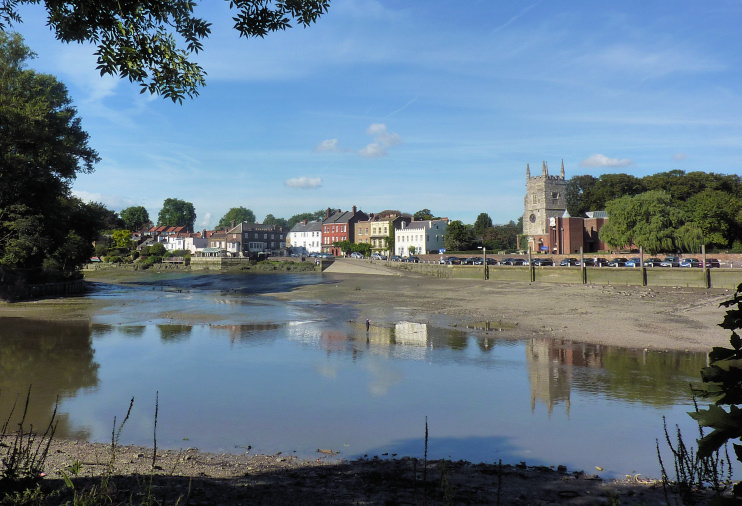 Shown in the photo­graph at the top,* Isleworth riverside is desig­nated both a conser­vation area (which extends to include Syon Park) and a ‘viewpoint in all direc­tions’, offering sights that include Isleworth Ait, Richmond Old Deer Park and Kew Observatory. The Isleworth Mona Lisa is an alternative version of the world’s most famous work of art, discovered in Somerset c.1913 by Hugh Blaker, who bought it and took it to his studio and gallery in Church Street. The painting’s present owners call it the Earlier Mona Lisa. * The picture of Isleworth riverside at the top of this page is adapted from an original photograph, copyright Andrew Bowden, at Flickr, made available under the Attribution-ShareAlike 2.0 Generic Licence. Any subsequent reuse is freely permitted under the terms of that licence.